Go Giants! This was for a big Giants fan for her birthday! Chocolate cake with a chocolate pudding filling frosted with white butter cream. Homemade of course. The accents were all made out of fondant. Just a simple 10 in square cake was used to assemble the cake. 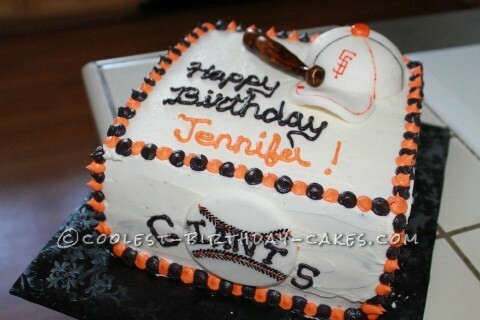 The hardest most time consuming was the little bat, hat and Giants Baseball on the front of the cake. Of Course all accent colors were orange and black. The bat was formed out of fondant and hand painted to look wooden, and the baseball hat was also made from fondant and formed to look realistic. I used wadded up paper towels to hold the bill of the cap so it could get its shape, then hand painted and stitched. The front ball was stitched with a toothpick and hand painted the Giants logo on it. Not to difficult just time consuming. But the whole party loved the cake, not just the look but how it tasted.